Sci-fi has come to McDonald’s. No, their employees aren’t pod people and their food isn’t made from soylent green aka people (cue Charlton Heston or Phil Hartman in his hysterical SNL spoof). The fast food restaurant has turned to sci-fi in a fun, 21st century way with virtual reality Happy Meals for kids and people who are kids at heart. I must admit, while I seldom hit Mickey D’s for sustenance, when I do I get either a Happy Meal, due to its child-sized portions, or a Filet-O-Fish sandwich. Now, McDonald’s in Sweden have included with their Happy Meals Happy Goggles, a virtual reality toy which works with the help of a smartphone courtesy of a parent or other adult. The chain has come a long way since milkshake machine salesman Ray Kroc first became involved with the McDonald brothers back in 1954. Happy Meals began in 1979 when they consisted of a small burger, fries and a tiny toy packaged in a bright red box. Originally, they included extremely inexpensive toys in the form of a "McDoodler" stencil, a snazzy "McWrist" wallet, or an eraser in the shape of a McDonaldland character like the Hamburglar or Evil McGrimace. You could almost liken the payoff to the kind of stuff you’d find in a box of Cracker Jack at that time. The objects soon graduated to themed toys, with the first being connected to Star Trek: The Motion Picture and then Disney-related paraphernalia. From there on out the toys have pretty much reflected the next big movie or series with children in mind. Happy Goggles are apparently the kiddie version of VR goggles, but kids make them from their Happy Meal boxes. With a little bit of folding, presto chango, you’ve got yourself a pair of cardboard virtual reality goggles. Their introduction is timed to celebrate the 30-year anniversary of Happy Meals in Sweden, not to mention an attempt at modernizing the classic kids' meal that is a part of so many of our childhood memories. McDonald's of Sweden is the first McDonald's in the world to create and distribute the DIY virtual reality equipment for kids. The company is also said to be simultaneously launching a virtual reality ski game to use with the goggles. The brand noted that two child psychologists were brought on to evaluate the goggles, Karl Eder and Fadi Lahdo, and provide recommendations for their use. "New generations are growing up in a world where smartphones and tablets are a natural part of life. Happy Goggles opens the door to virtual worlds, which of course is very exciting," a company statement said. Like their Happy Meals now offering healthier choices, such as apple slices and yogurt and reducing the portion of fries, the company wants to stay the course by providing educational experiences as well. "Now we want to try to add a digital experience that focuses on play and learning," McDonald's Sweden senior marketing manager Petra Dahlman said in a statement. 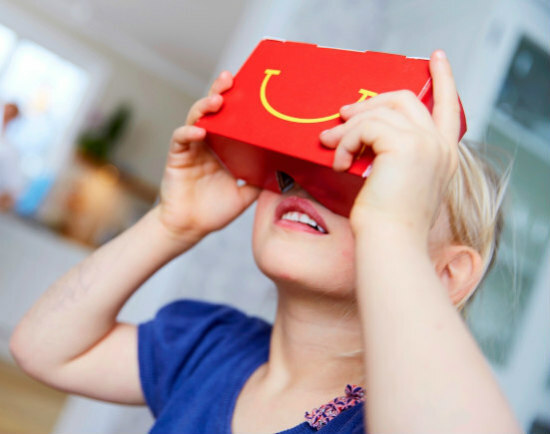 So far there’s no word yet if or when McDonald’s U.S.A. will package Happy Meals in boxes that can be turned into VR goggles, but they began distributing them in Sweden at select locations at the end of March this year. 8 That Weigh Your Way: Customize Your Bathroom Scale!